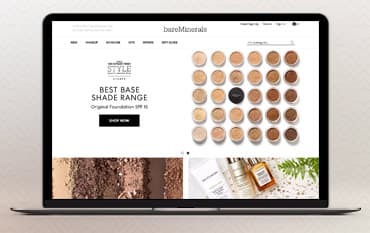 Simply enter your email to sign up to the bareMinerals regular newsletter and you will be given a unique code to use at checkout, which will discount your order by 10% instantly. Where do I use my bareMinerals voucher code? bareMinerals are clean without compromise, only producing products that are pure and proven, 100% free of chemical sunscreen, animal testing, phthalates, parabens and palm oils. bareMinerals believe in keeping potentially questionable ingredients off your skin and out of the environment which is why their product range is full of clean, natural and good-from-the-earth ingredients that are free of harsh chemicals and unnecessary additives. The products available in this impressive range include foundation, concealer, finishing powder, primer, blusher, bronzer, highlighter, eyeshadow, mascara, eyeliner, brow products, lipstick, lipgloss and lip liner. There’s also a huge array of makeup brushes available too including brushes for your face, eyes and lips, plus brush cleansers. As well as a wide variety of makeup bareMinerals also boasts a great skincare selection that includes moisturiser, serum, cleanser, masks, skincare brushes and tools and skincare sets. Shop for your skincare by skin type or concern and find products for dry, normal, oily and combination skin as well as products that focus on blemishes, anti-ageing and dryness. If you’re looking to replenish your makeup collection without spending a fortune then check out the sale and offers sections on the bareMinerals website. When shopping in the sale section you can filter your product search by type to discover cream, liquid, loose powder, pencil, pressed powder and stick makeup products and you can also shop for low cost, expensive, new, best-selling and featured products that will suit you best. If you’re looking for makeup that focuses on a specific area of your face or requirement then shop for your sale products by benefit to discover products that brighten, hydrate or plump the skin, that provide vivid colour, SPF and oil control or that are lightweight and long-wearing. One of bareMinerals’ top-selling products is their foundation. With completely natural ingredients, no harmful chemicals or substances included and an excellent shade range available, their affordable Original Foundation is ideal for everyone. Since the success of their foundation bareMinerals has expanded their selection to include nine different foundations and over 100 shades for every skin tone. Shop for liquid, loose powder and pressed powder foundation all of which is extremely affordable with SPF options available too. What is bareMinerals returns policy? bareMinerals hope that you are delighted with your order. However, if for any reason you are not entirely satisfied, you may return any item (with receipt) in its original condition for a full refund within 30 working days of receipt for a refund. How can I contact bareMinerals? bareMinerals believe that makeup and skincare should not only make you look good but also be good for your skin, which is why clean formulas are always at the heart of every product they produce. Ever since the inception of their bestselling mineral foundation in 1995, bareMinerals have worked hard to produce quality cosmetics at affordable prices. And luckily for you, all their products are available at a more affordable price than ever before when bought online using a discount code from us.